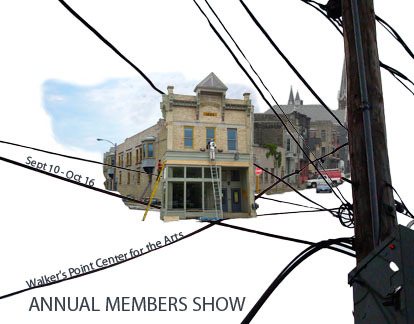 This mixed-media exhibition features the work of current WPCA members. The varied mediums, styles and concepts of the work included in the exhibition create an environment of juxtapositions as well as visual and conceptual kinships. The exhibition includes but is not limited to photography, sculpture, painting, drawing and printing. Work is available for purchase. By purchasing a work on display, you are supporting WPCA as well as our Artist Members. This large-scale oil painting has a distinct reference to Norwegian artist Odd Nerdrum. Schassler’s use of figure repetition and portrayal of a landscape with a vast sky and a golden ratio, has an affinity to Nerdrum’s work. The grotesque is also an attribute of Nerdrum’s style which Schassler embraces. Two nearly identical figures are depicted, each has one bulging eye closed so that the viewer can only see the plump flesh overlying an implied tumor-like deformity. The other cataract-covered eye stares blankly past the viewer so that although the two figures’ posture is forward-facing and confrontational, the figures themselves, with their somber and subdued expressions exude a mournful and removed quality. Schassler makes this painting his own with a satin sheen diverging from Nerdrum’s granular surface. He uses the color red- with its tenacious symbolic implications- minimally. A few well-placed brushstrokes on the chin of the figures create moments of intensity that give falter to the smooth movement of the painting. Yet the intensity of those moments soften as the red flows up the soft cheeks becoming a warm pink that gives the unsightly figures a touch of humanity. Wervey Vitamvas’ glazed porcelain sculptures relate to body, many appear to be breasts or are phallic in form. A handful resemble salt and pepper shakers with holes in their rounded peaks, yet remain nonfunctional, purely sculptural pieces. Wervey Vitamvas uses a medium in which there are many vestiges of sexuality- in the look of traditional pots as well as the making of them- and is forthright with this usually suggestive medium. Furthermore, she’s chosen to use porcelain, the aristocrat of clays, which gives her work a clean, polished look. Except for the delicate touch of pink on the peaks of her forms, she adds no color to the milky porcelain. When looking at her work it’s difficult not to reflect on the romantic rococo and neoclassical styles of the mid-late 18th century. Her reference to the perfect, glowing, impermeable skin of damels in work such as Baron François Gérard’s Cupid and Psyche (1798) and the detachment of body parts gives her work an almost mythological quality. Yet the lack of a certain rigidity often present in the neoclassical style suggests that it may be better described as having a rococo spirit: lighthearted and pleasurable, yet without the lavish excesses typical of that genre.